Do you ever feel like a chump paying for water when it falls from the sky for FREE? Installing means to capture and reuse rain water is an easy way to cut the costs and impact of watering your lawn and gardens. To capture the runoff place a rain barrel underneath your down spout. 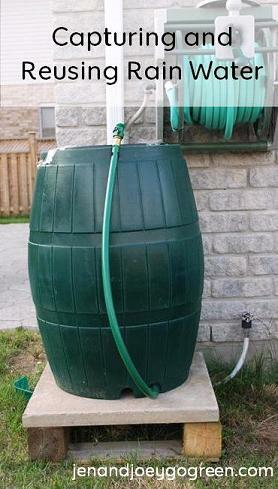 If you have a large roof or get a lot of rain consider installing more than 1 rain barrel. You can install them under each downspout or pick 1 downspout and hook multiple rain barrels up in a chain so that when the first one is full it overflows into the second one. To reuse the water in your rain barrel you can dip a watering can into the top or you can attach a pump to the hose on the bottom of the barrel and then run a hose off of it. Wondering where to get a rain barrel? Check with your city to see if they sell them or give them away. Also check to see if they offer rebates for using a rain barrel. You can buy them on Kijiji and Craigslist or you can make one yourself from an old barrel or garbage can. Think rain barrel but on steroids. A rain water collection system can be above ground or below ground. They are much larger than a rain barrel so they will hold a significant amount of water. Those that are above ground are attached to a down spout and have pumps attached to them for watering lawns and gardens. You can even attach your sprinkler system to the collection system so that you don't have to water your lawn with water from the house. A below ground system is attached to a downspout via a connection of pipes. This is a larger project as you have to dig up the group to place the collection container in. The plus side is that you don't have to worry about trying to hide it and you can protect it from freezing in the winter. An alternative to a fully closed rain water collection system underground is one that is open on top and feeds into an above ground water feature. The rain water is added via the water feature and through pipes that are connected to the downspout. 2. In areas you don't have a water collection container protect the garden/ground from the runoff with concrete extensions will allow the water to run away from your gardens. 3. Start small, you can always add more containers as you need them. 4. Pick a rain barrel that matches the colour of your house and then hide it with shrubs. How do you collect runoff? What do you use it for? Thank you for these tips, one of the things that I want to do is to get a rain barrel. Where do you recommend getting one? We got ours for free from a colleague who was giving one away. I would recommend looking around your house first to see if you have something you could repurpose. If not then look on Freecycle, on your city's website to see if they give them away and then on Craigslist. You can also get them at any hardware store. I had grand plans for a whole network of them until my landscaper told me the better option would be to not put in grass but rather ground cover that does not require water. So now I'm thinking of how to put one in to use for filling the pool. I need one or more of these! And for extra help in runoff, a rain garden (That I DO have). What is a rain garden Lynn? I've been thinking of getting a barrel for a while now. Thanks for all the info. Rain barrels are a great way to conserve water! Thanks for sharing! I REALLY want one. Our city has a program in the spring each year, but we were away on the pick-up day (bummer!). Definitely on my agenda though. You could always call and see if they have any leftover that you can pick up! I've always thought that was a great way to use something that you may already have! I'm not in the US so it is not illegal here ('m in Canada). I can't imagine why a rain barrel would be illegal anywhere.